Mitigating impacts of transportation projects uses avoidance, minimization, and compensation or offsite mitigation actions. This project developed a technical approach to address offsite mitigation which has often occurred during project execution, adjacent to the project, and in small, unsustainable, and ineffective actions. More recently, advance mitigation has been advocated to consider all projects in a long-range transportation plan and identify the pool of mitigation sites that should be conserved for use and implemented in advance of projects. The expected benefits of this approach are streamlined transportation projects and more effective and efficient conservation through the placement of mitigation projects in more desirable and sustainable locations. The Pikes Peak Area Council of Governments developed an initial Integrated Regional Mitigation Plan that quantified the expected impacts to a large number of species habitats and ecosystem types from the approximately 200 projects in the Long Range Transportation Plan. A multi-factor process was then used to select the pool of sites that could provide the necessary mitigation for a set of “mitigation targets” (those features such as habitats to be mitigated) and these were weighted with the presence of non-target but high priority biodiversity, other values such as ecosystem services, and locational importance such as proximity to existing conservation lands. 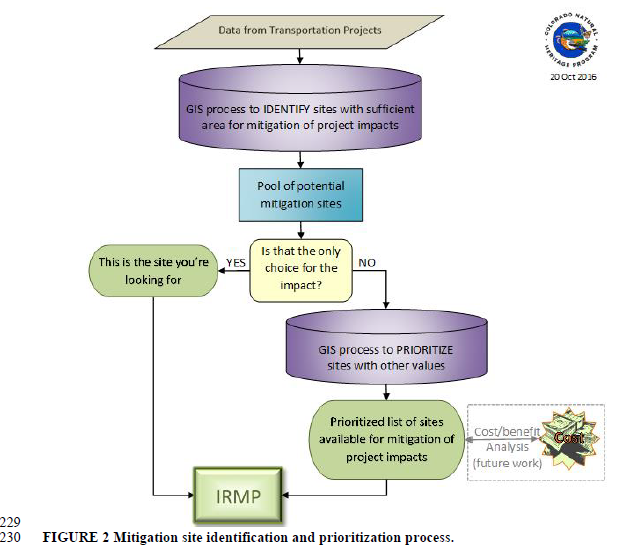 The resulting geospatial database supports regional planning and can be used by project and mitigation partners to identify the mitigation needs of individual transportation projects, identify candidate locations for offsite mitigation, and prioritize a set of sites for field 38 verification and other investigations into project suitability. Crist P, Fink M, Grunau L, Decker K, Casper C. 2016. Decision Support for Regional Advance Mitigation Planning in Transporation. NatureServe.